We often use heat as a modality in the hand therapy clinic to warm up the hands in preparation for therapy. A paraffin bath is one of the more intense forms of applying heat. During the hot wax treatment, the hand is immersed in a “spa” of melted paraffin mixed with mineral oil. The oil lowers the melting point of the wax (to about 120 degrees) and makes it tolerable for the body part to be immersed. The hand is dipped 4-5 times with a brief pause in-between dips to let the wax set. This layering creates a thicker coating of wax. After the last dip, a plastic bag is placed around the waxed hand; then towels are wrapped over the plastic to hold the heat in for 5-10 minutes. Because of the oil in the paraffin, it slides off the hand smoothly when the treatment is complete, leaving the hands feeling soft, moisturized and warm. The Paraffin Bath is useful for several conditions. The intense heat is good for circulation. The penetrating heat can ease aching. It is often used in arthritic conditions with good relief of joint pain. Aching from chronic repetitive injuries may also respond well to the wax treatment. Stiff joints will feel more flexible after an application of wax. Also works well with stiffness caused by fractures, dislocations and other trauma. Scars respond well to the heat and the coating of mineral oil, making them softer and more pliable in preparation for scar massage techniques. If there is numbness in the hand. If you have an open wound. If you have an injury that is acute, hot, swollen, inflamed. To keep the paraffin bath as clean as possible, wash your hands well and dry them thoroughly before immersing in the wax. If you have purchased your own machine, you can re-use the wax (however, we do not re-use wax in the clinic). 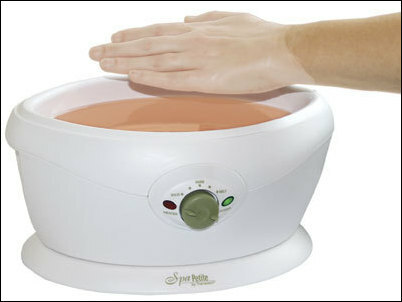 Paraffin Baths are easily available, both online and in local stores and pharmacies. Simple and small home units are priced around $40. A larger, more durable model can range in price from about $80 to close to $200. It is possible to make your own bath at home using an old pot in a double boiler or an old crock pot set on low. This can take a bit of time each session for the wax to melt. Once melted, turn off the heat and monitor the temperature until the correct temperature is achieved. It is important to use a thermometer to make sure that the wax is not too hot in order to avoid burns. The temperature should be 120-125 degrees. A locking, snapping, popping or catching sensation in the finger while making a fist. This “triggering” of the finger can be quite painful at times. The finger may “lock” into a bent position. There will most likely be pain or tenderness in the palm of the hand over the site of the pulley which holds the tendon close to the bone. There may be joint stiffness and pain in the affected finger. Avoid repetitive grasping and releasing of objects. Modify the activity if you are unable to avoid it. Look for ergonomic mice or larger barreled pens. Change your typing style so that your fingers are relaxed on the keyboard and mouse. Keep the fingers relaxed over the keyboard. Do not plant your wrist down on the wrist rest while typing as this causes excessive and stressful finger movements to reach all the keys. Rather, the wrist should glide over the wrist rest, allowing the fingers to be positioned over the keys in a relaxed manner. Purchase tools with padded, comfortable handles. Handles should have some texture for easier holding. Slippery surfaces require more forceful grasping. Minimize repetition. Periodically rest the hands during repetitive or stressful activity. Stretch frequently during repetitive activity. Use the lightest grip possible (on tools, pens, the mouse, the steering wheel, etc.) that still allows you to maintain good control. Use the least amount of force necessary during the activity. Use ergonomically designed tools if available (modified or padded handles, larger grips with good traction, handles with modified designs). Make sure that tools are in good condition and that cutting edges are sharp (reduces the force needed to use the tool). Alternate work activities so the hands are not performing any one task repetitively for any length of time. The location of where you are experiencing pain while working at a desk or on a computer can often give clues as to what needs to be adjusted during an ergonomic intervention. Here is a quick guide of worksite and work-method recommendations that may help when you are feeling pain in a specific area. Finger Pain – May indicate arthritic joints, a trigger finger, or strain from overuse. Avoid squeezing the mouse too hard or pounding the keyboard. Keep a light touch when typing. Hold your pen lightly when writing. Thumb Pain– May indicate a trigger thumb or DeQuervain’s Tenosynovitis. Often occurs from either squeezing the mouse too hard or from tensing the thumb (as if hitch-hiking) over the keyboard keys. Keep the thumbs relaxed using only the minimal amount of force needed to control the mouse. When typing, keep the thumbs relaxed and just hovering over the keyboard. Don’t pound the space bar. Also, when writing, use a larger-barreled pen and don’t squeeze the pen too tightly. Keep the thumb tip relaxed and only slightly bent – it is common for people write with their thumb tips bent at an extreme angle. Wrist Pain or Pain at the Base of the Hand/Thumb– May indicate a tendinitis where the wrist muscles attach (flexor or extensor tendinitis), DeQuervain’s Tenosynovitis, or Carpal Tunnel Syndrome. These are often caused by swiveling the mouse in or by poor wrist positioning. Keep the wrist neutral (flat – not bent forward or back or angled side-to-side; the middle finger should be in a parallel line with the forearm). Initiate small movements to control the mouse from the elbow and shoulder. Don’t squeeze the mouse too tightly – use only the minimal amount of force necessary to control it. Check your keyboard size and fit. Pain over the small finger side of the wrist is often caused by the outward angulation of the wrist required to rest your hand on the home keys. Using an ergonomic split keyboard is a quick-and-easy way to provide neutral wrist positioning. Elbow Pain – May indicate an inflammation where the forearm muscles attach into the upper arm bone at the elbow – Medial or Lateral Epicondylitis. Can also be caused by several nerve compression syndromes that occur near the elbow – Cubital Tunnel Syndrome, Radial Tunnel Syndrome. Check out the positioning of the keyboard height and mouse location. When working at a computer, your ear, shoulder and elbow should be stacked in a vertical alignment. If your elbow is not relaxed at your side, you may need to change positioning by lowering the keyboard surface or getting in closer to your desk. The elbow should not be bent at more than a 90 degree angle while using the computer. A mouse that positions the arm in a more neutral “hand-shake” position may also be helpful. Don’t swivel the mouse from the wrist. Also, keep the hand relaxed on the mouse and use only the smallest amount of force necessary to activate the mouse click. Don’t hold the index finger stiffly over the mouse (as if pointing) and don’t pound the mouse buttons, especially with a straight finger. Rather, keep the index finger slightly bent and lightly touching the mouse. Shoulder Pain – Often caused by reaching forward for long periods of time for the keyboard or mouse. When working at a computer, your ear, shoulder and elbow should be stacked in a vertical alignment. If your elbow is not relaxed at your side, you may be reaching forward causing strain on the arm muscles. It takes work to hold the arm in this position for long periods of time even if the work itself is not too forceful. To keep the upper arm muscles more relaxed, you may need to lower the keyboard surface or get in closer to your desk. Check your chair. Are you sitting back in the char? Does it provide proper lumbar support and seat depth? Look at the arm rest height. You may need to lower the arm rests in order to keep the shoulders relaxed. Neck Pain, Eye-Strain & Headaches – Often caused by poor positioning of the monitor. Position the monitor directly in front of the keyboard so you are not twisting the body while using the computer. Check out the height and distance of the monitor. It may need to be adjusted so that you can clearly see the monitor print without tipping the head forward or back. Avoid using bifocals while on the computer. If you work extensively from copy, keep the copy in front of the monitor or directly to each side. Use a tray that holds the copy close to monitor height to avoid repetitively looking up-and-down from the copy to the monitor. Use a phone headset to avoid cradling the phone between the shoulder and the ear if you need to type and talk at the same time.